Though the scalloped silhouette of Pomona’s backplate looks simply sweet, this flower makes a powerful fashion statement. Strong fabrication ensures that Pomona’s fresh appearance will endure for years to come. A hoop finial atop the fabric shade completes the whimsical look. 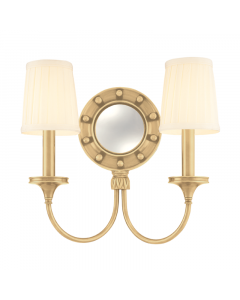 The sconce measures 6.5”W x 13.25”H with a 7.5” extension. The backplate/canopy measures 6”. Total number of 1 light, 60 watt max. Bulb not included. Socket type is E12 Candelabra. Item weight is 2 lbs. The shade has a finial attachment and has a hard back, off white shade. The shade measures: 4” top, 6.5” bottom, 5.5” height. UL Rating is damp. Ships via UPS. 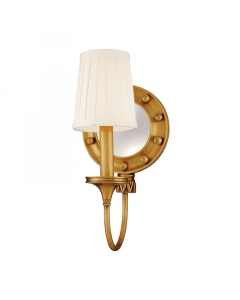 Available in Polished Brass or Polished Nickel. Please select finish from drop down menu below. Click on image for greater detail.